Looking for a workout, a new addition to your fleet and a great way to keep your drivers fit? 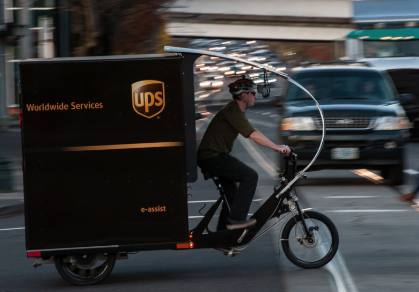 Consider what UPS has done with the launch of an eBike that will deliver packages in Pittsburgh, Pa. The electrically-assisted tricycle is designed to help reduce carbon emissions in addition to minimizing traffic, noise and air quality challenges in Pittsburgh. The deployment is part of UPS’s Cycle Solutions and the company’s Rolling Laboratory, which tests alternative fuels and advanced technology vehicles. “Working with cities like Pittsburgh to provide them with a delivery solution that helps reduce congestion and emissions and improve air and noise quality is the latest example of how to meet the needs of today’s cities,” said Barb Jaram, UPS Mid Atlantic District president. The success of the eBike was first demonstrated in 2012 in Hamburg, Germany, where UPS focused on developing a new and sustainable method of delivering goods to urban areas. UPS placed four containers at central locations in the city for interim storage of packages for UPS drivers. From these points, deliveries were made on foot or with specialized electronically-assisted cargo tricycles that ease traffic congestion and reduce emissions each working day. Due to the success of the pilot, the Hamburg program was already extended. That model serves as a prototype for the company’s new eBike in Pittsburgh, Pa.